There are many application wide settings necessary for successful running of the application. This section exclusively gives access to user to define all type of settings ranging from defining cache, different formats, preferences, authentication to appearance. At any level, user has got liberty to add new setting and make necessary configurations to make it work. View All : It will display all the messages. Value : This can be either Yes or No. Display Type : How you want to display the message i.e. as text, checkbox etc. Sorting : Clicking on any column head once will sort the records in ascending order while clicking one more time will sort them in descending order. To add new settings, following form should be filled with necessary details. Config Type : Configuration Type shows configuration it refers to exactly. It can be related to any of the following list so select the most appropriate one. Display Type : How you want to display the message, select the type from following list. Default Value : There can be either default value or not. Validation Code : If you want to put any validation, check the checkbox. 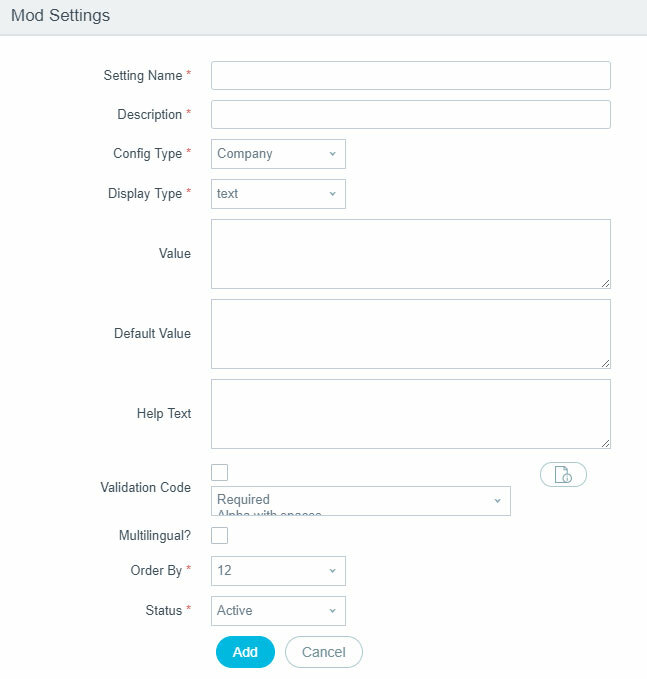 Select the type of validation and click on the adjacent icon to write validation message. Status : Choose from Active and Inactive. Add : This will add new message. Cancel : This will cancel the add process and redirect user on previous page.